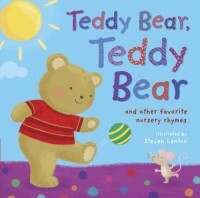 Introduce your toddler to nursery rhymes with this beautiful board book with a squishy cover. With many treasured classics, including “Little Jack Horner” and “Polly Put the Kettle On”, little children will love the soft illustrations bursting with warmth and cheer. The easy to turn pages are great for small hands, whilst the padded cover and sturdy format will survive the roughest of treatment. The perfect way to share all your favourite nursery rhymes with your little ones.